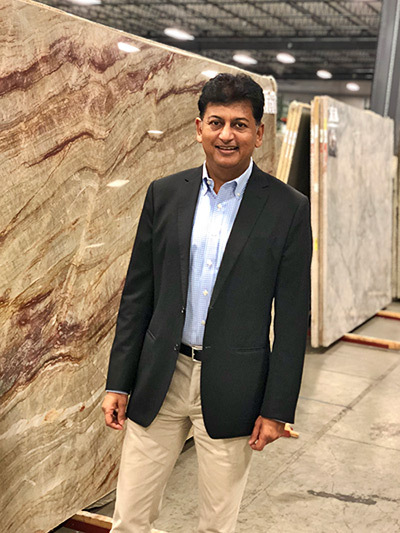 Sunny Surana has been in the granite industry since June 1995. CRS Marble & Granite was founded by Sunny Surana in 2005, and would quickly become the stone industry’s stand out supplier of exotic Quartzite, Granite, Marble, as well as Quartz. What began as a small family-run business has turned into model for success that never stops challenging itself to do and be better. With offices in Brazil and India, CRS has firmly established itself as a major international player. Since its inception, CRS has stayed true to its home grown mission: To continue to be a hands - on company whose dedication to exemplary customer service is unsurpassed. With an entrepreneurial spirit and a keen eye for quality, CRS is a company that prides itself on strict attention to detail when purchasing stone. Sunny travels to international quarries in remote, mountainous areas to uncover high end exotic stone with prime finishing. At CRS Marble & Granite we are keenly aware that even the most beautiful stone will not sell without the expertise of a dedicated sales team. That’s why we offer personalized and professional service, performed by dynamic salespeople. We walk you through the process of stone selection from beginning to end. Our aim is to demystify and simplify your buying experience so that you enjoy being here and leave knowing that you purchased the absolute best stone for your lifestyle. Experience: Since 1995 supplying the highest grade materials to stone fabricators, designers, builders, architects and homeowners. We have four showrooms in Raleigh, NC, - Virginia Beach, VA – North Charleston, SC – Austin, Texas. Inventory: Your orders are expedited quickly thanks to our computerized organization system that is updated daily. We have a fleet of 12 trucks to get the material you need when you need. Diversity of Colors: CRS Marble & Granite carries a huge inventory of 350 exotic colors along with a complete line of basics used by contractors and home builders. We have something for everyone.